If you do not do some simple maintenance there will come a day when you open the lid of your washing machine and it will smell and not in a nice way. There are a number of reasons why washing machines smell and the man thing is to remove the smell before you wash your clothes otherwise they are not going to come out smelling clean. Before we look at how to remove the smell lets have a quick look at why it is there in the first place. 1. Overusing the detergent: The instructions on the box or bottle of laundry detergent will usually tell you to use an amount of detergent that is excessive for your needs. Too much detergent, especially liquid detergent can be the cause of an unpleasant odour in your washing machine. The reason why their recommended amount is too much is that you probably don’t do a lot of washing loads with clothes that are very dirty. The average amount of detergent is 1 tablespoon to keep your clothes nice and clean. 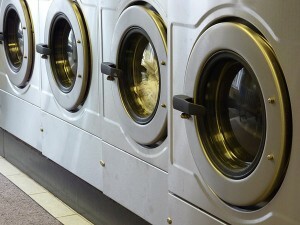 You can actually test to see if too much detergent is the problem in your washing machine. Run a basic cycle without any clothes or detergent and if suds appear then try reducing your detergent. 2. If you use fabric softener: Sometimes when you use fabric softener, especially regularly, residue can build up on the outside of the outer tub. The smell comes from the mould and bacteria that forms as a result of this residue. 3. Using cold water to wash: Do you mostly wash your clothing in cold water? This may be the problem if you answered yes. Residue can build up inside the machine and cause a smell. 4. Unused washing machine: When you are going away or not planning to use your washing machine for a period of time, clean it before you do so that when you do use it again it should be free of nasty odours. 5. The drainpipe may be blocked: When the drainpipe for your washing machine becomes blocked less water is able to flow through which means that mould can build up causing it to smell. 1. Leave the door of the washing machine open: Air your washing machine out on a regular basis so it is more difficult for moulds and bacteria to form and cause the machine to smell. 2. Run a hot wash: This is especially for those of you that tend towards cold water washing. Every now and then do a cycle of washing with the hottest wash. It will help to break down the residue build-ups in the drainpipe as well as the washing machine itself. 3. Vinegar cuts through the smell: Run an empty washing cycle with a cup of vinegar in the machine. 4. Use some baking soda: Again run an empty cycle but instead of vinegar use a cup of baking soda, which will absorb the odours from the washing machine. 5. Swap to powdered soap: If you use liquid laundry detergent and you are consistently having a problem even when you reduce the amount that you use try swapping to a powder detergent to see if that helps with the issues that you are having. 6. Try cleaning the soap dispenser: If the washing machine soap dispenser becomes full of residue this can also cause a smell so make it a habit it to clean it regularly before the build up occurs.